But behind the scenes, a fierce competition is underway — a duel between two young magicians, Celia and Marco, who have been trained since childhood expressly for this purpose by their mercurial instructors. Unbeknownst to them, this is a game in which only one can be left standing, and the circus is but the stage for a remarkable battle of imagination and will. Despite themselves, however, Celia and Marco tumble headfirst into love — a deep, magical love that makes the lights flicker and the room grow warm whenever they so much as brush hands. True love or not, the game must play out, and the fates of everyone involved - from the cast of extraordinary circus per­formers to the patrons - hang in the balance, suspended as precariously as the daring acrobats overhead. First off, let me just say that these are my favorite kinds of book. The ones that have you slowly rushing pages because you need to finish it. When you find your eyes jumping ahead, words jumping out at you that spoil or intrigue. That’s why I read. To be entranced. And that’s what I got from The Night Circus. Absolutely spell bounding. Terrific. Magical. Romantic. Engulfing. Tragic. Beautiful. LOVED IT! Need I say more? The Night Circus was an enchanting, mind-boggling story that enraptured me. It was confusing, lovely, frightening, elusive, all at once. There are times I loved this book, times I didn’t, times I wanted it to be over already, and times I never wanted it to end. Put shortly, it’s a conundrum. A lot like the circus itself. I don’t know what I expected going into this book, but I know I didn’t get it. Let me be clear: this is a purposely confusing book, but unlike many other confusing novels, this didn’t distract from the story. If anything, it enhanced the creepy, mystical atmosphere, and kept me reading. Morgernstern’s prose was beyond beautiful – it was seductive as her words draw you in and, even during the times where you have no idea what is happening, you don’t want to shut the book. The characters were fascinating, yet almost two-dimensional in a sense. As there were so many characters, and the novel flitted quickly between their POVs, I couldn’t really get the best sense of each character. There were definitely a few that I could – the side characters – but the two main characters – Celia and Marco – were not as well-developed. All in all, this was an entertaining book, although it was hard to read, and, not going to lie, my patience was tested a few times. Everyone was so freaking in love with The Night Circus, I figured there would be no way I could be any different. And I was...wrong. When I finished The Night Circus, I felt like it was lacking something. Maybe more depth, maybe a more exciting plot. I don't know. The romance, if it can be even considered romance, was horribly written. Celia and Marco may have been infatuated with each other's magic abilities but in no way was it anything more. The way the book was set up made the plot so complex to understand. Halfway through I had to take a break from the book and figure out what the hell was going on. Maybe it was set up to be intriguing, but it just seemed complex and unneeded. Other readers will love The Night Circus. And I can see why. The book had a certain magical quality that seemed to pull readers in, but I just wasn't fooled by the magic. Maybe I wasn't the book's target audience, or maybe I wasn't in the right kind of mood when I picked it up. Either way, this book was a hit...and a miss. In all honesty, I don’t know how I feel about this book. at times it is exasperating and other times it was undeniably engrossing. I don’t know if my exasperation was due to impatience or if the plot of this book was drowned in too many details but I’m sure that some parts of it felt so vividly imagined that I couldn’t put the book down for fear of breaking the spell. The ending left me agitated. I know, of course that a nicely fitted ending is a luxury in literature and that one mustn’t make a habit of expecting or seeking out books with endings that eave nothing open for interpretation; that the uncertainty of an open ending is in itself, one of the most appealing things about literature. Erin Morgenstern described her books as “Fairy tales in one way or another”. That is the perfect description of this story. It’s a fairy tale. A tragic tale of love and loss and sacrifice. the book tells the story of Celia and Marco; two young manipulators: Magicians, sorcerers. whatever you want to call them who have been entered into a competition when they were only children. The competition entails that they out perform each other, magic-wise. Or so they think. it just so happens that the arena of their competition happens to be a circus. All be it, an extraordinary circus but a normal circus none the less. only with the influence of Celia and Marco’s magic, the circus becomes a place of mystery. An entity in its own right, and very soon people begin noticing and the circus develops a following of devotees who seek out something within its enchanted grounds that they cannot put a name to. They find themselves drawn to the magic even though they don’t believe in it. some of them even rearrange their whole lives to revolve around the circus; following it wherever it goes. as the competition draws on, Celia and Marco finds that even though they are rivals, they are drawn to each other. The bonds that hold them together are more than magic and rivalry; they are the bonds of love. unbeknownst to them, the competition is not one of magical talent and skill. It’s one of stamina: the rules of the game dictate that in order for there to be a winner, only one of them has remain alive in the end of the contest. inevitably, the game takes a toll on more than the players themselves as everything around them plunges into chaos. Celia and Marco have to try to save the lives of everyone involved in the circus as well as maintain a hold on their fragile love, but it comes with a price and the sacrifices made are not easy for either of them. Final Thoughts: this isn’t a cheery book. I would avoid this if you are going through a sentimental phase in your life. unless of course, you like stories about star crossed lovers with unfortunate endings. The Night Circus is anything like I’ve read before. It was such a dazzling journey I admit being quite speechless but I’ll try to explain myself in this review though I believe it won’t be coherent. 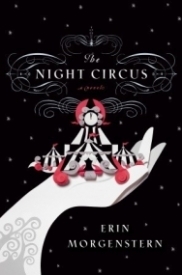 This book, brought to us by Erin Morgenstern, is a magical romance within a game in which Le Cirque des Rêves is the venue. We are presented to Celia Bowen and Marco Alisdair and they need to prove to their mentors that one of them is stronger than the other. And what was once a competition, soon turns into demonstrations of affections through magic and illusions. The circus isn’t a normal circus. It appears out of thin air, without warning and you never know when it’ll disappear. As soon as you approach the fence, you understand it’s not an ordinary circus with clowns and animals and tricksters. Instead, you find several tents, each one even more wonderful than the other. And despite being a circus, it lacks colour, the black and white stripes and main pallet being the only colour around you. Apart from one or two shades of red from the Rêveurs. Morgenstern created a breathtaking book that hooks since chapter one. As soon as you enter the circus, you don’t wish to leaves it and when you stop reading it even for a minute, you barely recognise your world and know where you are. You don’t know what’s real and what’s not. The writing was beautifully developed. There’s two distinct timelines within the book that twist together at the end. You might find it complicated to read two different moments in time, but the way Erin divided them and marked them was rather smart. At each change, she would add a small description of the circus, letting us get inside it as a visitor rather than a reader. I found those small snippets a brilliant way to caught our attention to the venue. I will be utter honest with you, I am trying to resume something I felt so personal I believe I’m not actually making any sense at all. This book is a total excited and mystical experience it differs from person to person and you need to go through it to fully understand my statements. You need to visit the various tents, the various characters and moments in this book to understand the magnitude of what Erin Morgenstern created. It lies within your feelings rather than in your writing ’cause, for me, it’s being a difficult task for me to put it in words. Magic works in mysterious ways and, for me, this book was a dazzling journey in which love conquers all and dreams are told to come true. With this story, I believed in the power of magic and, I can honestly admit, I’ve became a Rêveur. Everything in this book is simply amazing. This is a book filled with magic and mystery. It was both riveting and mind blowing. The author so intricately describes the circus and the story that you feel part of the dream. The story line was enchanting and extraordinary. Mystery, suspense, romance, and tragedy all wonderfully stitched into on book. Celia Bowen is brought to her father, Prospero the Enchanter, at a very young age where her talents are discovered. He begins to teach her how to use and control these powers for a challenge his friend, Alexander, and him have set up. Alexander, or the man in the grey suit, has taken on a boy, Marco, for the upcoming challenge. They are both rigorously trained day in and day out. Although neither are really sure what they are training for, they pour themselves into their studies to please their instructors. Plans are drawn up, people are involved, and before you know it a circus is up and running. This is not just any plain old circus; no this is a circus of dreams. It goes beyond your wildest imaginations and further still. It is the chosen venue for the challenge to commence. Marco is placed in the service of Chandresh Lefevre, the proprietor of the circus, and becomes his ever faithful assistant. During one of the interviews for the circus’ illusionist, Marco discovers his opponent for the challenge and slowly plots his first move. Since he is incapable of following along with the circus, he places a spy, Isobel (a tarot reader madly in love with Marco) on the inside to keep tabs on Celia’s every movement. As the circus grows and tent after tent rises up from the dust, so does their love for one another. They feel a strong connection to each other that neither one can resist; not to mention they seem to balance one another. Little do they know they are bound to a losing game. They are faced with tragedy and deception along their journey. They make life long friends and wondrous memories as the challenge progresses. Though who will be left standing in the end? Who will win this unknown challenge? What will their choices mean for others? Although I thoroughly enjoyed this book, I can see where this can be a challenge for others. I enjoy a book that can transport me into the story. Yet, a lot of readers may feel that the descriptiveness in the book took away from the story. I felt quite the opposite. I loved the detail the book provided. It really allowed me to picture the authors vision. I also enjoyed the different perspectives throughout the book since it gave me the opportunity to actually get a feel for each other the characters. I highly recommend this to anyone with an open mind. It really was a fascinating story. Though if you are not a reader who enjoys long drawled out details in a story, this is not a book for you to settle on.